Today’s offering comes from the recent Capcom Heroes 2012 calendar, art by Yusuke Murata. If you’ve perused near the end of the Mega Man Official Complete Works book, you may remember him as the guy who submitted the original Dust Man and Crystal Man designs as a kid, then grew up to become a successful manga artist. 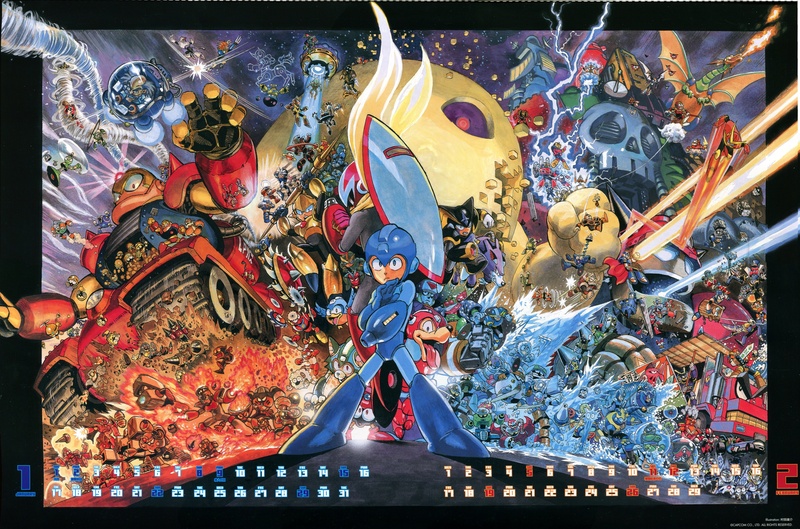 Here he’s created an incredibly detailed collage of classic Rockman characters (and even a few X ones for good measure) that’s simply amazing to gaze over and try to take in all the crazy action going on. Who can you spot? See the large version of this, click here. It’s an image stitch, so there’s a few parts that don’t line up (most notably Rock’s helmet). If you want to see the original in all it’s glory, it’s not too late to import one of these calendars… Though I’m hoping to see a quality version come up in the upcoming R20+5 art book also. 9 Comments to "Yusuke Murata’s Epic Rockman"
Great picture! Except for Reggae and other humans besides Wily, everyone is there! There are even two characters from MMX! 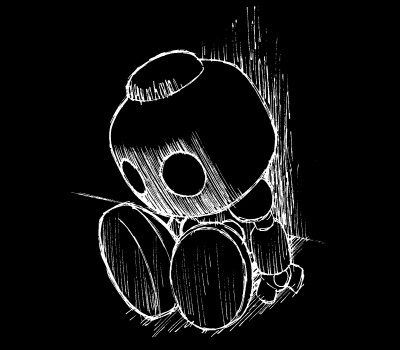 Oh yeah, forgot to mention that, from the robots with serial numbers, Roll is the only one absent. She must have been busy posing for the Girls calendar right then. 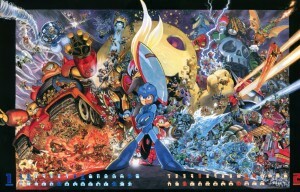 Very cool, do you have the rockman art from the other pages and calendars?. there are no words to express how awesome this is. also, I see them too! the two X characters! If I may ask, exactly where are the two Mega Man X characters in this picture? Under the Guts Tank’s tire treads near Heat Man , Ground Man and Drill Man is a Crag Man, and atop Gamma’s arm there is a chain of robots smacking each other with maces, and one of them is a Hoganmer. They’re both regular stage enemies from the first Mega Man X.